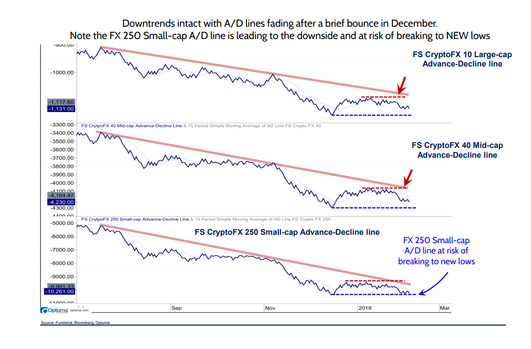 One of the first positive convergence trends is the weakening of the US dollar, which Fundstrat envisage will inversely affect the non-correlated BTC price. Similarly, the firm expects market equities to outperform the US stock market, which Fundstrat postulates will invigorate crypto and other similarly non-correlated, risk-on assets. Speaking of traditional investments, the report expects that institutional money will come in this year, thanks to the evolution of investment vehicles, such over-the-counter trading desks, and crypto custody solutions; alluding to ventures from the Intercontinental Exchange and Fidelity Investments. The report also notes on-ramps and off-ramps as a major catalyst, specifically citing Binance’s recent facilitation of debit and credit cards. Within blockchain growth the report specifies the progress of scaling solutions, adding that the lightning network almost reaching critical mass will bolster investor confidence, along with advancements and adoption of privacy technology. Recently proposed that due to a weak technical position, the crypto market may be in for a retest of the lows exhibited toward the end last year, adding that smaller projects are at the most risk. Will 2019 be a better year?